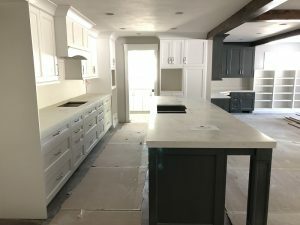 Canyon View Drive: The Final Stretch! Today’s on-site meeting was exciting because the paint is done and they’ve removed all the masking! It’s so fun to see how everything is coming together and Jon and Marisa are so anxious to move in! There is still about a month left of finish work to do, but we’re definitely in the final stretch. We spent most of our time discussing details: paint touch-up, where to end the tile backsplash since the pantry shelving was built slightly differently than anticipated, how to fix an awkward wall/cabinet transition, is it normal for concrete to crack (the answer is yes), where should the holes be drilled for the kitchen faucet, what’s the best bark to use in the flower beds, how to infill the critter hole under the front porch steps, etc. Everyone weighed in, we arrived at solutions, and the project will continue to move forward smoothly and ahead of schedule (primarily because the initial schedule was realistic)! 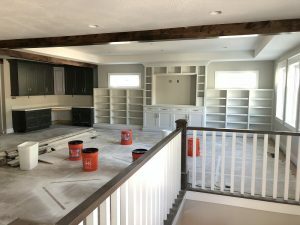 Remodeling is very complex with a million details to work through, many of which cannot be anticipated beforehand, as hard as we try. There is always a solution and in my experience the best end result will come from putting together a wonderful team of experts to work through the process with you. Believe it or not, I think everyone involved in the project is having fun! We all respect each others roles, everyone is giving their best effort, and the end result is a wonderful home for Jon, Marisa, and their family (even though their 7 year old is claiming she liked their home better before the remodel). The paint is done and they’ve removed all the masking! It’s so fun to see how everything is coming together and Jon and Marisa are so anxious to move it! There is still about a month left of finish work to do, but we’re definitely in the final stretch. ← Canyon View Drive: 6 Month Update!